What Is a French Double Bed? A Victorian bedroom can be a luxurious place to lay your head. Deep colors and highly decorated curtains, bedding and flooring provide the backdrop for a multitude of accessories and displays of china, bronze, carved wood and colored glass. The perfect compliment to a Victorian-era house, the traditional colors and style of the Victorian bedroom will transport you to a more gentile time and place. Here's how to achieve the look in your home. Victorian-era colors were rich and bold and perfect for a restful bedroom. Paint your walls a deep maroon, violet blue or dark forest green. Use an eggshell finish to add to the rich look of the paint color. If you'd like to add a little modern touch, paint the wall where the bed sits a deeper shade of your room color to add some additional depth and drama. If you are undecided about your wall color, find a traditional Victorian [art print](https://society6com/prints?utm_source=SFGHG&utm_medium=referral&utm_campaign=133) to use in the room and pull your main color from the painting. You are sure to find one of the above colors featured in your selected artwork, so take your painting to the paint store for an exact match, or select a coordinating color to work with. An authentic Victorian bedroom would also feature dark wood trim. If your current woodwork is painted, you'll have to strip it and then stain it a deep, dark brown, which will frame your luxurious paint color nicely. A Victorian bedroom would feature a great bed, so when selecting a properly styled Victorian-type bed frame, don't skimp on your purchase. Select a heavy mahogany or walnut bed frame with as much detailed carving as you can find. A canopy bed is also acceptable, but again, look for thick posts and carved details. A cast-iron or bronzed bed frame also fits into a Victorian decor, so check out antique shops and online sources to find an authentic bed or a convincing reproduction. If you can't shell out the bucks for a bed frame, don't fear. You can dress up your bed in the Victorian way and no one will even notice it's missing. Dressing the bed was a real event for the Victorian household and would include luxurious fabrics and decorations. Silk sheets will make it authentic, but to save money you could go with a high-thread-count dark maroon sheets. The coverlet or quilt should be opulent--quilted, embroidered or highly decorated with gold trim and tassels. Ruffles and pleats in silk or velvet will transform your room into a Victorian dream. If you can't find really over-the-top bedding, check out the fabric at your local sewing shop and have a friend hem some up for you. No Victorian bed is complete without a pile of pillows, all dressed in silk and tassels and gold-threaded designs. Purchase a variety of sizes and shapes and place extra ones on occasional chairs or a window bench. 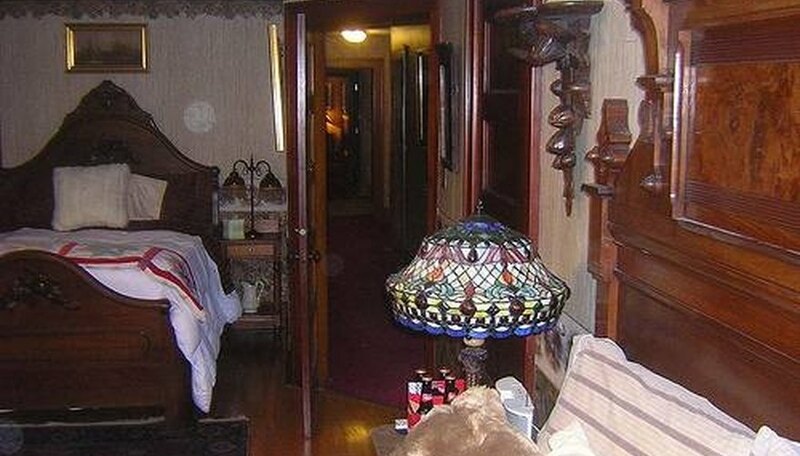 Everything is thoroughly dressed in a Victorian bedroom, and that includes all the furnishings. You'll want ornately carved wood dressers, a vanity, bureau and round tables to be placed bedside. Side tables should be draped in fabric and feature bronze or porcelain table lamps. Marble-topped bureaus were also in style in Victorian times and can be used in your bedroom. Victorian bedrooms feature doilies under lamps and on top of wooden furnishings, so pick some up at an antique store or vintage shop. Chairs should have embroidered seats and be in a dark wood color. If your bedroom is large, you could create a cozy sitting area for reading to include an upholstered chair and round table. Place hardcover vintage books on the table for interest. 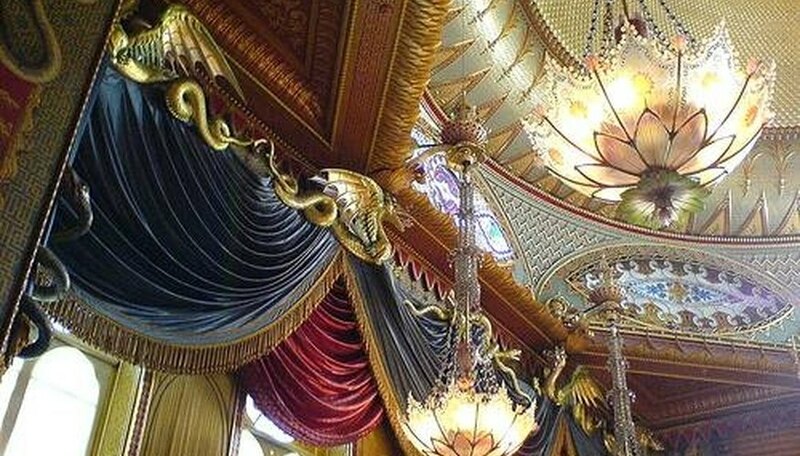 Windows are dressed to mimic the most ornate theater, with heavy velvet or dark silk fabrics. Brocade trim, tassels and pull backs are also required to fulfill the Victorian design. You may want to place a lace curtain closest to the window to let in light during the day, and then add the heavier drapes to the side for drama. Floors should be hardwood and dolled up with a traditional Oriental rug in a red tone. Heavily designed, the rug will help the eye to travel throughout the room and will provide that authentic "antique" feel. 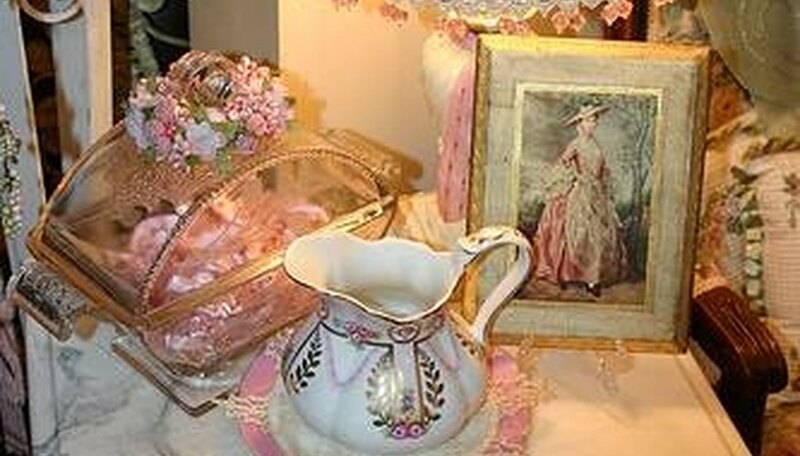 Accessories are vital in an authentic Victorian bedroom and should not be skimped on. 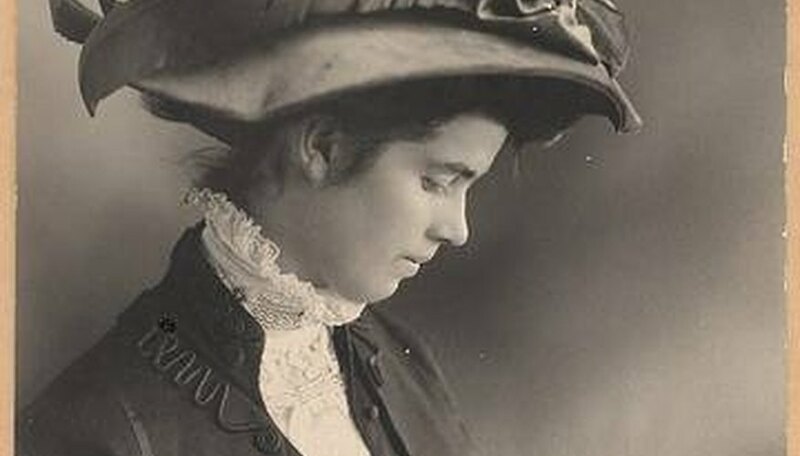 Layer in antique photographs in silver or bronze-colored frames and purchase a few Victorian-era reproduction paintings for the walls. Botanical prints were also popular in this era, so find an old botanical book and frame up the drawings in vintage frames. Dressers and vanities should be heaped with jewelry boxes and vanity sets including a silver tray, hair brush and mirror. Candles can be placed throughout the room in silver candle holders, and small porcelain knickknacks will also lend Victorian authenticity to the space. China and colored glass pieces are also very Victorian, so shop around and buy pieces you love. What Is the Hollywood Regency Style?